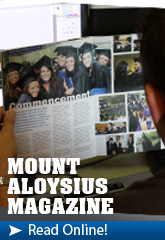 Mount Aloysius College is a member of the Allegheny Mountain Collegiate Conference. As a NCAA Division III program, our emphasis is on an integrated intercollegiate athletic experience for student athletes, emphasizing academic success, competition. campus engagement and community service. 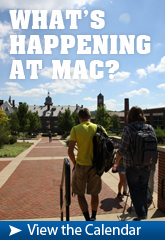 Our message to students is to get involved! Mount Aloysius students value the co-curricular and extracurricular opportunities available at the College which enhance their personal development and provide a complete college experience. Active engagement in the college community with direct application of our Mercy Values helps students become successful leaders in their careers and involved citizens in their communities. Opportunities to be involved are wide ranging including social events, clubs and organizations, athletics, community service, campus ministry and internships. While preparing students for careers or advanced study, Mount Aloysius College recognizes the importance of a broad liberal arts education. Thus, in addition to solid preparation for a chosen career, every student at Mount Aloysius is provided a liberal arts education. The College’s distributive core of courses ensures that every Mount Aloysius student has a basic body of knowledge in preparation either for a career or for further education. NOTE: Although the academic programs and courses represent available areas of study at Mount Aloysius College, the College reserves the right to withdraw any course or curriculum at any time. Transportation to and from practicum sites must be provided by students. Mount Aloysius College provides cooperative programs which were implemented to augment and enhance student-learning opportunities. These cooperative programs typically provide a bachelor degree from Mount Aloysius and a graduate degree or certificate from the cooperating college or university. Consultation with the Department Chair is required of all students. Agreements can change annually. The history of the College is rooted in the life of the Religious Sisters of Mercy who founded and sponsor Mount Aloysius College. Catherine McAuley founded the Religious Sisters of Mercy in Dublin, Ireland, in 1831 as a congregation devoted to the works of Mercy. It was one of the first active congregations of women religious in Ireland. Today, Sisters of Mercy serve in North and South America, Africa, Asia and Australia continuing their original charism of service to the needy through advocacy and direct service in health care, educational and social service agencies and institutions. The spirit of the congregation, dedicated to honoring the mercy of God, is one of enterprising response to need, coupled with compassion and hospitality, a spirit which is a goal of the Mount Aloysius family. Mount Aloysius College traces its Mercy heritage to the small community of Sisters who were sent to Pittsburgh in 1843. From Pittsburgh, they established a community in Chicago in 1845 and by 1848 they settled in nearby Loretto. On St. Mary’s Street in Loretto, the Sisters built a school, which was to be the forerunner of St. Aloysius Academy. The Academy, built in 1853, was moved to its present site in 1897. In 1939, Mount Aloysius Junior College was founded through the initiative of Sister M. deSales Farley, R.S.M. In 1991, Mount Aloysius amended its charter and scope of programs to include bachelor degrees. In the Spring of 2000, the College’s charter was again amended to include master degrees. The Mission of Mount Aloysius College is to respond to individual and community needs with quality programs of education in the tradition of the Religious Sisters of Mercy. Each student will have the opportunity to acquire knowledge and to develop values, attitudes, and competencies necessary for life long learning within an environment which reflects a liberal arts orientation and a Catholic, Judeo-Christian heritage. As a Catholic College founded and sponsored by the Religious Sisters of Mercy, Mount Aloysius College provides a setting in which students are encouraged to synthesize faith with learning, to develop competence with compassion, to put talents and gifts at the service of others, and to begin to assume leadership in the world community. With emphasis on values of justice, hospitality, mercy, and service, the College’s liberal arts core curriculum provides the necessary basis for leadership and the knowledge and skills for success in a wide range of professions. While the academic focus is paramount at Mount Aloysius, the College also considers spiritual, cultural, social and personal growth as essential elements in the development of the student. Encouraging all students to explore their religious heritages, Mount Aloysius College welcomes women and men of all creeds, races, nationalities and ages who wish to participate in the life of the campus community. Through course work, religious activities, and service, all students are challenged to grow in faith and to fully engage in their intellectual growth and personal religious commitment. Committed to making available a student-centered education, Mount Aloysius tailors its academic and co-curricular programs to meet the developmental needs of each student. Welcoming students with a range of abilities and economic resources, the faculty and staff work to enable each student to reach his or her fullest potential. Academic advising, direct contact with faculty and staff, personal counseling, and educational enrichment courses are resources provided to students throughout their college careers. Students are also encouraged to participate in extracurricular activities that include student government and other student organizations, athletics, theatre, and other social and service programs. Mount Aloysius College strives to be a just and caring learning community where hospitality and compassionate service are hallmarks. Building on its early history as a women’s college, Mount Aloysius continues to have a particular interest in the education and advancement of women even as it has made the commitment to co-educational offerings in all programs. The College is firm in its commitment to creating an environment for living and learning in the hope of supporting the lifelong intellectual, spiritual, and emotional development of every student who experiences the unique and exceptional Mount Aloysius College education. 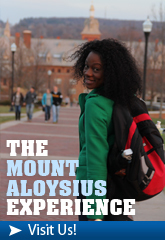 Mount Aloysius College is an accredited, comprehensive, degree-granting institution offering Associate, Baccalaureate, and select Graduate Programs where women and men of diverse cultural, educational, and religious backgrounds optimize their aptitudes and acquire skills for meaningful careers. Mount Aloysius graduates are job ready, technology ready, and community ready. We affirm and embrace the Catholic heritage of higher education, seeking knowledge and communicating truth from its manifold sources. We challenge and empower students in all programs to attain the goals of a liberal arts education - character development, critical thinking, communication skills, a passion for continual learning - and to become responsible, contributing citizens. We cherish and revere the charism and example of the Sisters of Mercy, our founders and inspiration. We make concrete the Mercy Values - mercy in all relationships among students, faculty, staff, and administration, justice in all our endeavors, with hospitality and service to all at Mount Aloysius and in the larger community in which we live. In pursuit of these values, our faculty and staff personally engage, care for, and mentor each student. In practice as well as in word, we help all our students - including those facing significant challenges - to pursue their objectives. We honor and sustain the Mount Aloysius legacy of being an “engine of opportunity” for all our students, helping them surmount economic and educational hurdles that inhibit their aspirations for productive and fulfilling professions. To this end, we recognize that responsibility is shared across the Mount Aloysius community. Our faculty acknowledge and promote the truth that learning for career and for life takes place both in and outside classroom settings. Our staff give daily support to students, enhancing the process that brings them to their graduation day. We require service of our students so that they will recognize that educational attainment and self-giving are inseparable components of the good life. We rejoice in the assistance and loyalty of trustees, alumni, and the larger community who contribute in multiple ways to our mission, modeling the conviction that fulfillment ensues as a result of generous living. Moving forward, we intend to continue providing high-quality, affordable and accessible higher education, within a collaborative and holistic learning environment, with support services designed to help students meet their goals, and to respond to employment needs in our region and beyond.